It’s helpful to learn about lavender look-alikes, whether as perennial garden substitutes or simply as an identification tool. Purple or blue flowering spikes, silver needlelike foliage, and bushy growth are the three traits most people associate with lavender’s visual charms. Several plants possess one or all of these traits. Although it grows happily in unfertilized and low-water gardens, lavender may fail in extremely cold or humid climates. Gardeners often turn to hardier plants like Russian sage or catnip to evoke the mood but none of the problems of lavender. Perovskia atriplicifolia looks strikingly similar to lavender, but survives harsh winters with greater ease. Cultivars of the plant range from 2 to 4 feet tall and wide. Choices from the dwarf ‘Little Spire’ and the delicate ‘Blue Haze’ and ‘Filigran.’ Not technically a sage (or even from Russia), Russian sage nonetheless has a pungent, sagelike scent that helps repel deer, said University of Arkansas Extension in naming it one of its "Plants of the Week" in 2000. Give it plenty of sunlight and dry soil. Where Russian sage resembles the more blue-toned of the lavender varieties, hyssop mimics the deep purple types. Common hyssop reaches about 4 feet in height, with needle-like leaves. Rock hyssop, which stays under 2 feet, looks like some of the dwarfing lavenders. Give the plants dry soil in a sunny location. If your soil tends toward the acidic, use wood ash or garden lime to raise the pH level. The plant has culinary, fragrance and medicinal uses. Although this foliage-heavy mint cousin doesn’t have quite the spiking purple presence of lavender, from a distance the plants are similar. Unlike lavender, Nepeta cataria tolerates partial shade and slightly humid conditions. “Herb Companion” magazine notes that some varieties feature white blossoms, so for those seeking the hues similar to lavender the magazine suggests sticking with the nepeta varieties N. sibirica, N. grandiflora, N. subsessilis, and N. yunnanensis. While some gardeners use the terms “catnip” and “catmint” interchangeably, catmint is usually considered a smaller version of nepeta and may prove unsuitable as a lavender substitute. Grow catnip in sun or part shade, and in dry soil. Use the herb in teas or as mouse and ant repellent. Salvia azurea, also known as pitcher sage, blue sage and prairie sage, has similar height, width and growing conditions to lavender. A favorite of Southeast gardeners, according to the Herb Society of America, pitcher sage boasts blue flower spikes and grayish-green foliage. Like lavender, pitcher sage is prized as a potpourri ingredient. It differs from lavender in that its flowers don’t begin emerging until late summer. 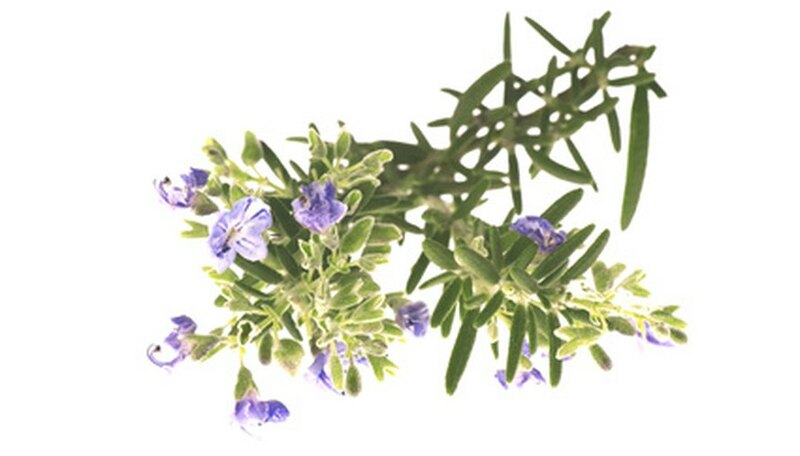 Rosemary possesses silvery, needle-like foliage strikingly similar lavender’s. In addition, when the herb flowers in late summer, its pale blue or pink flowers share the same hue and spiky habits of some lavender cultivars. In warmer climates, rosemary grows as tall as 6 to 8feet, with the same bushy habit and love of sunny, rocky soil as its fellow Mediterranean herb, lavender. 'Joyce DeBaggio' and 'Tuscan Blue' have the most lavender-like intense coloring.